4 Bedroom Semi Detached House For Sale in Exmouth for Asking Price £315,000. With views towards the estuary and Haldon Hills beyond, this four bedroom semi detached house is located in an extremely popular cul de sac location. The accommodation on the ground floor comprises of the entrance hall, ground floor WC, double aspect lounge and kitchen opening onto the dining room. On the first floor are the four bedrooms (three of which are doubles) and a bathroom with white three piece suite. 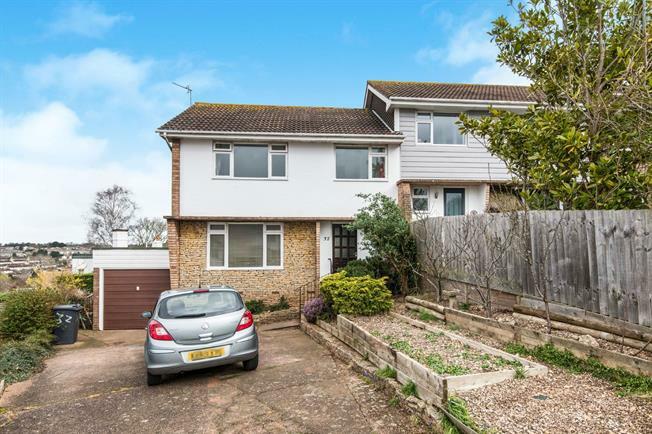 To the front of the house is parking for several cars and access to a large garage/workshop whilst to the rear is a delightful lawned garden with patio area which enjoys the far reaching estuary views.